Senior libero Carks Niedospial celebrates. 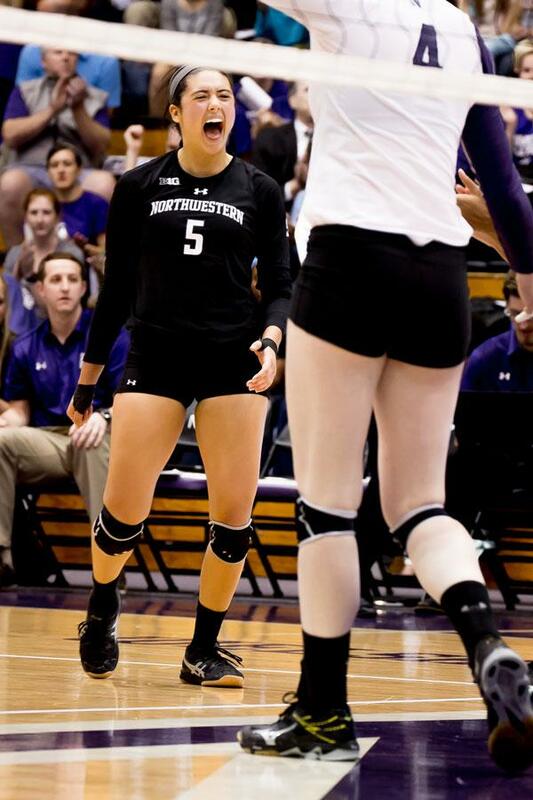 Niedospial, who leads the Big Ten in digs per set, will be looking to lead NU to much needed wins against Michigan and Michigan State this weekend. Northwestern enters a homestand this weekend looking to reverse a disappointing stretch. The Wildcats (12-9, 4-6 Big Ten) lost two straight games last weekend on the road, and they are hoping to rally this weekend against No. 25 Michigan (15-6, 5-5) and Michigan State (14-7, 6-4). Although neither opponent leads the Big Ten or NCAA in any particular aspects of play, the Wolverines’ and Spartans’ superior — and more consistent — records in and out of conference play has NU on its toes. Coach Keylor Chan talked this week about how the key to breaking this streak of inconsistency is hard work. This potential showed itself during the team’s recent match against Penn State but hasn’t resurfaced since then. The Cats have plenty of potential with players like redshirt senior libero Carks Niedospial, who currently leads the Big Ten in digs per set. Niedospial brings aggression from the service line and across the court, and that’s exactly what she feels the team needs this weekend against the Wolverines and the Spartans, she said. Aside from being aggressive and upping their game, as a whole, the team has to keep its eye on Michigan’s junior middle blocker Abby Cole. Cole has been outside hitting for the past three games, accruing double digit kills every game. NU junior outside hitter Kayla Morin said the team needs to work together to succeed against a player like Cole. And there isn’t a better place to unify than at home. Morin said it’s time they begin showing a sense of urgency. “This is great chance for us to move forward in our Big Ten play and start the second round off strong against two teams that we have a history of competing against and have a strong rivalry against,” Morin said.